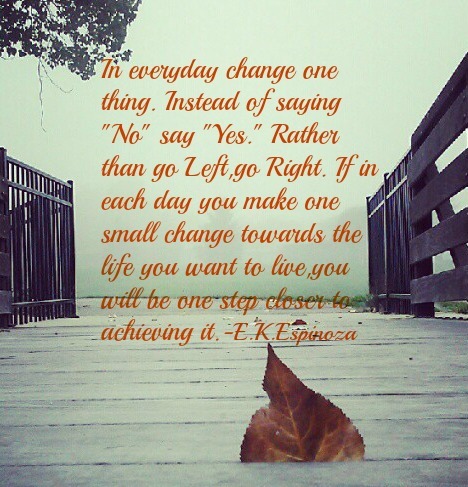 Erica K. Espinoza | E.K.Espinoza | Discover how your thoughts determine the life you live. Time to hit the reset button. I spent most of yesterday morning thinking about what I was gonna post today and of course here it is and I’m at a loss for words. Ironic? Maybe not so much. I’m 41 now had a couple of birthdays since 2012 and really feeling the change. Spending a lot more time thinking about my past and my future and how to handle them both. What’s important, what’s not so important. Pretty much a slippery slope to a midlife crisis, just without all the panic. I learned to let go of a lot of things. I learned I’m never gonna get the apologies or thank you’s I deserve and that I can move forward without them. I learned I need to change the way I think and react towards people who are different from me and think different from the way do. I’m pinpointing my weaknesses and my strengths which is about the same as letting go of those grandiose, out of reach ideas I have about my life and I how it should be. And I’ve accepted that there are people who care about me, and some that never will. All in all, I’m in a critical milestone, a pivotal point in my life that’s requiring more from me than any other time in my life. And I want to be 100% in touch with that. It’s a make it or break it shift. it’s that time when you decide, ok, for the past 40 years I’ve done things and thought a certain way and this is where it’s got me. Do I go all in and keep going or do I try new ideas and see where that takes me as scary as it may be? Well it’s been quite sometime since I’ve felt the urge to start writing again. The ever famous ” Once a writer, always a writer.” seems to be once again rendering true. A lot has happen since 2012 which was around the time of my last post. Maybe so much that writing had started to feel like a dream I used to have and not so much as a dream I was still pursuing. With the popularity of blogging I was really turned off by the melee of ambitious writers with empty content. Anyone and everyone with an opinion was writing and the stage was starting to look like an arena out of Gladiator. Ugh. Enough of that. So with a bit of time away and a lot to say, I’ve decided to take a different approach than before and write more for myself with an intent to fulfill my personal legacy. From this day forward I will make at least 1 daily post. This is for myself improvement. This is for my being to see and understand how my inner thoughts are affecting my life. So I can get a tighter grasp on were my mind is, what my goals are and where I’m going. I’m writing to myself. For myself. Lenawee Great Start Collaborative Articles.. But I wonder if “The truth..” is really what they want to hear. October brings more than pumpkins,hoodies,hayrides and bonfires. Just as the seasons change, so too, many of our feelings and emotions can “Fall-back” now that Summer days are peeling away. And not everyone is immune to it. It’s those feelings you get when the party’s over and it’s time to clean up. That “last call for alcohol.” The wake up call that reminds us,it’s time to take inventory,count our losses and settle in. Truthfully speaking,I’ve never been a big fan of Summer. Growing up in the Midwest, it was the October rains,waiting for the colors of the trees to change and football games that I was raised to love. The coolness in the air broken with the sounds of the crisp leaves on the ground reminded me of two things: 1) I had made it another year. 2) I was alone. Something I have grown to love. I didn’t want to hear the truth that I was where I was because I had made no attempt to be anything or anywhere else. I was actually excited that I had made it through another year with little resistance and even less effort to change. I had become a Pro at “laying low.” I had once again swept my ambitions under the rug in exchange for a book and a cup of Chamomile tea. Which brings me right back to my reality. Some of us,a few of us, see the truth of life differently. 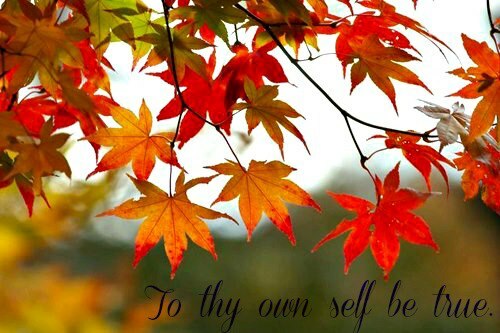 While others are pushing and pulling through life to be accepted and liked. While year after year some are growing faster and stronger and seeming to be passing us by,we are happy to walk through life and catch up later. So if you see someone or know someone who you think needs to hear the truth about their life,needs to accept some harsh honesty, remember that not everyone really wants to hear it. Never has this been truer than today. Literally. As another Monday approached I spent my morning doing what I normally do: Walking the dog,making breakfast and taking my son to school. But it was on the way home from dropping my son off that my “everyday” changed it’s direction. As I was taking my normal route home I had recalled an ad I had seen on-line for position available at a local company. It sparked my interest because it was in the mental health field,that of which I have a strong background. But what was peculiar about this position was that the company was only accepting offers through personally delivered resumes,nothing online or email. Most any other time I would have thought it too much work and too out of my way but on this morning I couldn’t get it out of my head. Two stops from my home while sitting at the light a debate began in my mind,”Turn left to visit the company and drop off a resume or go straight and leave it for someone else to contend with.” Back and forth,back and forth. My eyes watching the light to change,thinking Left or straight? Left or straight? To heck with it,I turned left. Thinking to myself well you’ve made your decision might as well go all in,I stopped in,grabbed my resumes out of the car and waited along with some other job seekers patiently for my turn. While I was waiting an older women caught my eye. She was maybe late 40’s,black long hair pulled back,regularly dressed,jeans and a sweater,nothing fancy just a simple older woman who put off an aura that maybe she was new to the area. I must have observed her so much that she spoke to me. “Hables espanol?” she quietly asked. Do I speak Spanish? Being of Mexican heritage it’s certainly not the first time I’ve been asked and I replied with my normal ” Poquito,no mas.”-” A little.” Instantly she smiled and I noticed what a beautiful smile she had,such a kind face. One that I couldn’t possibly turn away from no matter how poor my Spanish-speaking skills were. In our language she began to unravel to me a story of how she had come from the neighboring state and had heard of “Trabajos-jobs” here in Michigan and since she had just gotten her High school diploma,she wanted to take her chances. She asked me about “Emails” and “Resumes?” things she seemed to be a little unfamiliar with. She began to tell me that she had been living in a migrant camp picking tomatoes but now of course that the seasons were changing she was looking for a factory job to help support her family. “I want to work!” she insisted. “I don’t want the unemployment,I rather work.” It was as if, had I of walked away from her, she wanted me to know that one thing about her. I asked her how long she had waited for someone to help her and she relayed she had been there since it opened but no one had said anything to her. She said she just wanted to know how she could get an email and make a résumé,since now she was a graduate. I made a couple of phone calls to some of my more fluent Spanish-speaking friends that gave her some connections on who to talk to and places she could go that were hiring. I stayed with her,made her an email and built her a strong resume as best I could. After about an hour I left her own her own to work on learning the computer and other things she was eager to know. I walked out,got in my car and left. Not till I got in the car and notice the stack of resumes I had never dropped off. It didn’t matter. As I sat in my car feeling very grateful for the opportunities I have had,I was most grateful for one thing: That I had turned Left. It wasn’t for me but was for someone else who needed me to come her way today. I have been nominated for one lovely blog award. Today a fellow blogger nominated me for A Lovely Blog Award. It is my first nomination. I am so grateful for being able to express myself without judgement but instead a beautiful recognition. This is definitly a place a writer,blogger, a simple dreamer can call “home.” A safe haven. for recommending me for this nomination.and write/share 7 random things about myself, according to the rules and to nominate 15 other bloggers. 1. I am a Michigan native,mother to 4 sons. 2. I am a humanitarian and dream of owning a Log Home. 3. Sometimes I am to hard on myself,and find forgiving myself even more difficult. 4. I believe that Life will always find it’s way. 5. I want to be a better parent,daughter,sister,friend. 6. I gave up a high paying career to pursue my passion: Writing. 7. I understand that peace,joy and happiness can only come from within me and I am a work in progress. Thank you again and congratulations to all the nominees.